Superintendent Dr. David Leach, second from left, applies a tourniquet to Meghan McGourty, the district’s Director of Student Support Services. 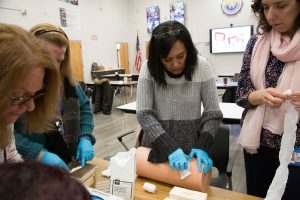 Teachers, staff members and administrators in the Warwick Valley Central School District are receiving life-saving trauma response training, making Warwick Valley the first school district in Orange County to partner with Touro College of Osteopathic Medicine to offer such training. Doctors, paramedics and certified instructors from the Touro College Middletown campus are presenting the training program, Stop the Bleed, Save a Life, to staff in the coming weeks. 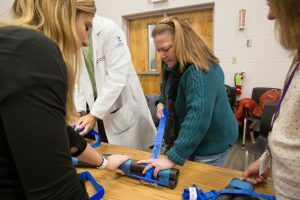 During the two-hour course participants are taught how to control bleeding in an injured patient using compression, bandages and tourniquets. Bus drivers, teachers, principals, secretaries and coaches are among those learning how to stop uncontrolled bleeding after an injury, enabling them to provide crucial first aid. Sanfordville Elementary School Nurse Creslyn Driscoll treats a simulated wound during Stop the Bleed, Save a Life training. Brown, who is leading the training. “The most awful feeling in the world is feeling helpless.” But virtually anyone can learn the basic life-saving actions, she said. Dr. David Leach, Warwick Valley Schools Superintendent, said the training makes Warwick Valley that much safer for everyone, including students, staff, and visitors. “Like any emergency training, you hope you never have to use it. But no matter where our people are – at home, shopping, on the road or here at school – if the unthinkable happens we will be better prepared,” said Dr. Leach, who also received the training. 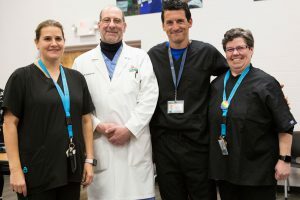 The Touro College “Stop the Bleed” team:” (l-r) Dr. Joyce Brown, Dr. Alex M. Joanow, Dr. Martin Torrents, and paramedic Kelly Kohler. Class participants learn how to use the supplies found in trauma first aid kits – gauze, gloves, and a tourniquet – to treat injuries. If a trauma kit isn’t available they learn how to use clothing as makeshift bandages and compression material. 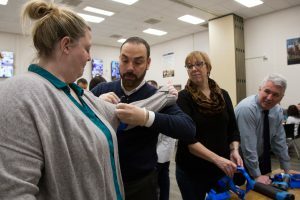 During the class they treat simulated wounds, learn how to protect themselves from blood-borne disease, and apply tourniquets to themselves and one another.